One very popular Missouri pastime during the cold winter months is bird watching. Birds can be drawn to an apartment complex balcony as well as a 40 acre open farm! No matter where you are, you can create the perfect bird paradise! All you need are a few essentials to make your back yard absolutely beautiful with colorful birds against the white snowy backdrop! Here are a few tips to drawing the most beautiful birds Missouri has to offer RIGHT to your backyard! As any living creature, birds need HOUSING to protect them from the cold wintry elements. Clean and Sanitize your current bird houses or come browse our store for new ones! We’ve have several to choose from. Birds need lots of FOOD during the cold months to keep them warm. Offering different types of seed and suet will attract a larger variety of birds. We have many types of bird food available in our store! One more thing is needed to make your winter birding a success. Our feathered friends need flowing WATER to insulate their feathers. We have heated bird baths and heaters to heat bird baths you already have! 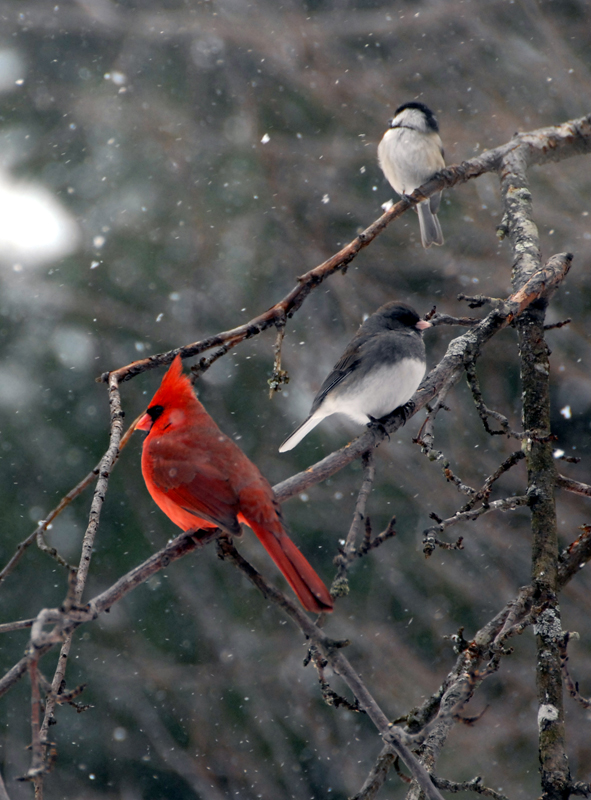 Turn your yard into a winter birding paradise TODAY!